Be the first on your block to collect the limited edition Washington Apple Pi Winter 1999 Garage Sale Computer Show & Sale poster! This limited edition poster, printed on the finest (whatever you happen to print it on), is sure to be a treasured family heirloom as it is passed down, from generation to generation, in old paper bags and antique floppy disk boxes. Grab a copy, in genuine Adobe Acrobat 3.0 (.pdf) format, or striking JPEG-compressed format, or even curiously litigious GIF format. Print out several hundred copies so that your relatives, coworkers, friends and total strangers can share in this unique event, held just before the curtain rises on Y2K! 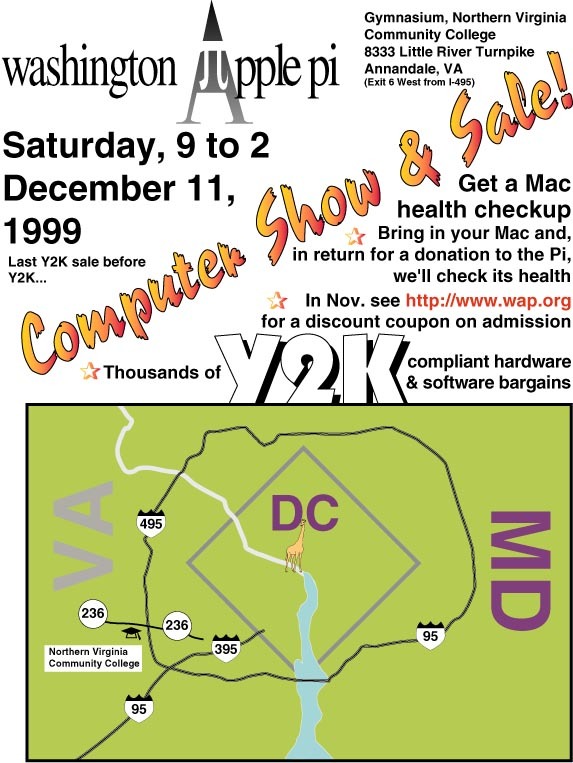 And, speaking of Y2K, if you have a Windows machine that is about to bite the dust, the Washington Apple Pi Winter 1999 Garage Sale Computer Show & Sale is the perfect opportunity to pick up some Y29K Macintosh hardware and software! We even have great decorating ideas for what to do with dead Wintel comptuers! While you are at it, be sure and get a limited edition Washington Apple Pi Winter 1999 Garage Sale Computer Show & Sale coupon! 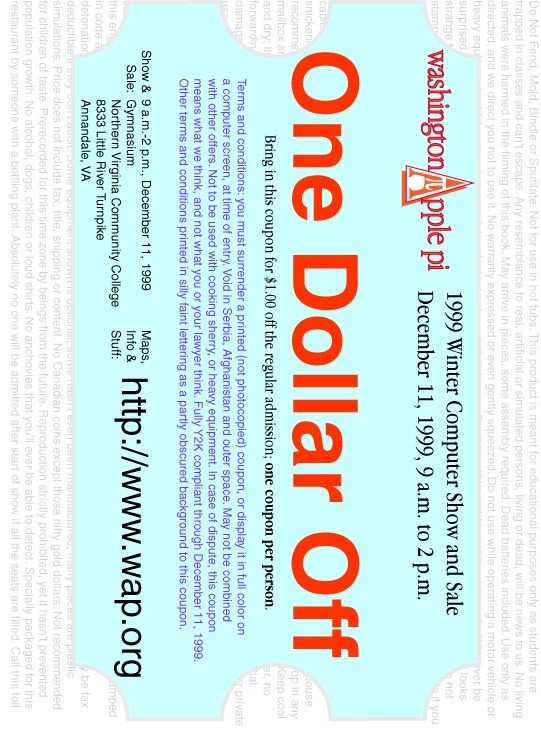 Printed on the finest (whatever you happen to print it on, or displayed in color on a handy portable computing device), this valuable coupon provides a discount on admission to the Washington Apple Pi Winter 1999 Garage Sale Computer Show & Sale, the last such sale of this year! Like the commemorative poster, the coupon is available in three flavors: genuine Adobe Acrobat 3.0 (.pdf) format, or diet-aware JPEG-compressed format, or lawyerly GIF format. For the curious, we have pictures of several past shows, including a movie, plus a photo of our original inspiration! We'd like to thank some local teenagers for help in the placement of extra exclamation points in this document!